Sorry I didn't take any pictures of my own. But, truthfully, besides the packaging, there's not much to photograph as the glosses are clear. So. 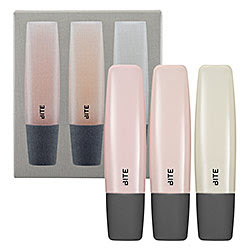 The Bite Beauty Vitamin Gel Trio. I've been curious about these ever since they showed up on Sephora.com and now that I've briefly tried them, here's what I think. First thing I noticed was the size of the tube. They seem like they'd be bigger based on the picture on the website. They contain .31oz each. The packaging is nice. The box of the trio contains three boxes inside, each containing a full size Bite Vitamin Gel. The tube is a molded clear plastic with a slant tip applicator and a very lovely grey rubberized cap. Blood Orange: I like blood oranges, too, but this doesn't smell or taste like one. It starts off smelling just like Orange Pop LipSmacker, but after a second that scent fades and it becomes pure bergamot scent and flavor. That's okay because it reminds me of Earl Grey tea, but not what I expected. Mint: Just a light, sweet mint. Reminds me of something else... C.O. Bigelow Mentha Lip Shine? Very similar. The texture is thick, oily/waxy and smooth. It's not so much a gel as it is a balm. It actually reminds me of the texture of Rosebud Salve, just not as slippery once it melts. It's more waxy, but it becomes melty and slick on the lips with a little thickness left over. It stays on for a while, but it doesn't feel particularly moisturizing or soothing. I actually find it a little bit irritating, but I've only worn it for a day, so this may change. The color? There's no color. From the description online I thought there would be some tint, and there is a visible tint in the tube, but it is invisible on the lips. These retail for $18 EACH. Seriously. $18 for an average lip balm, just because it contains Resveratrol. Thanks a lot, Dr. Oz. But, the set is only $28, $24-ish after the discount, so that's not so bad. But still, I would never pay $18 for one of these. They're quite ordinary. Weak scents, unimpressive formula. Pretty packaging, but that's just not enough for me to justify the price tag on these. If they were in the $7-$10 price range individually I might consider keeping them, but not at this price point. -The caps are loose. Once you unscrew them a few times, they become loose and spin too much, they never align properly or feel secure again. -They last a really long time on my lips and look really nice, not too much shine. Good texture but still not very moisturizing. -They sorta irritate my lips a little... A slight itching/tingling/raw sensation. Hm. -Scents are still way too weak. Love an honest review! Thanks for the info, now we can all make a wise decision and save ourselves some money at the same time! The name and the flavors are amazing... too bad these actually aren't. For a new brand it seems like a lot of the Bite stuff is overpriced. For those prices I prefer to buy more established brands. THANK YOU for this honest review. Love it! I highly recommend the BITE glosses though, they're very glossy and amazingly moisturizing texture. I don't like the Balm, and I think I'd be with you on these, I need color though, so I wouldn't have ordered them : ) I hear the lipsticks are great too.